​Use the ragout sauce (ragu if you're Italian) as your base; simply cover with mashed potato and some grated cheese and heat for 25 minutes in a 200C oven to provide a delicious and nutritious cottage pie. Then; as you progress towards LCHF, gradually reduce the potato content and replace it with mashed cauliflower mixed with some cream cheese, cheese and butter, until it becomes your 100% low-carb favourite. A Shepherd's pie rather than a Cottage Pie is of course usually made with lamb and without the wine and tomatoes (oh yes, and with a few peas).My tip: try using 2/3 lamb to 1/3 pork mince for a great taste. 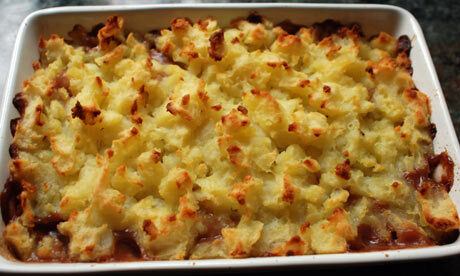 ​Watch the 2 1/2 minute video which shows how to make your low-carb cottage pie. The recipe is for 8 people, so you also learn how to pack and freeze two small pies for later. Are you interested in knowing more about the nutritional impact of making your own cottage pie vs. store bought? Just download the pdf and then run your own analysis against your own current store bought favourite (if you have one). Remember: the most important thing with 'home-made' is that you are buying the ingredients that go into this delicious pie; so you know exactly what's going into it.